We showed that thinly traded long-dated, deep out-of-the money SPX put options were bought on August 24, 2015 at implausibly high prices, purportedly to cure margin deficiencies. We showed the price of one SPX put option increased from $4 to as high as $83 in seconds as a result of auto-liquidation transactions after which the option price quickly dropped back to around $4. These auto-liquidation trades converted an account from a credit balance to a debit balance in seconds when a rational liquidation would have cured the margin deficiency and left the account equity intact. In this blog post we explain how rational liquidations would have saved an auto-liquidated account using another stylized example from an account that was liquidated to a debit balance during the morning of August 24, 2015. Far from our prior example, we use prices of near expiration, at-the-money call options on Barclay’s VXX ETN linked to the VIX index with different strikes to demonstrate the harm caused by auto-liquidations that occurred while an investor was froze out of making trades in nearby options. American-style call options give the holder the right to buy an asset at a fixed price on or before some future date. For example, a call option on the VXX expiring August 28, 2015 with a strike price of $24 gave investors the right to buy the VXX for $24 per note on or before August 28, 2015. If the VXX is worth more than $24 when the options expired, the investor would receive the difference between the VXX price and the option’s $24 strike price. If the VXX was worth less than the $24 strike price at expiration, the option would expire worthless. For the same underlying asset (VXX in our example) and the same expiration date (August 28, 2015 in our example), options with lower strike prices are worth more than options with higher strike prices. To see why this must be true, consider Table 1 and Figure 1. The $23 strike price pays the same as the higher strike price options when they all pay nothing and pays strictly more than the higher strike price options when they pay anything at all. Thus, the $23 strike price option has to be worth more than the $24 and $25 strike price options. 1. If VXX closes less than $23, all three options expire worthless. 2. If VXX closes greater than $23 but less than $24, the $23 strike price option pays something less than $1 and the other two options pay nothing. 3. 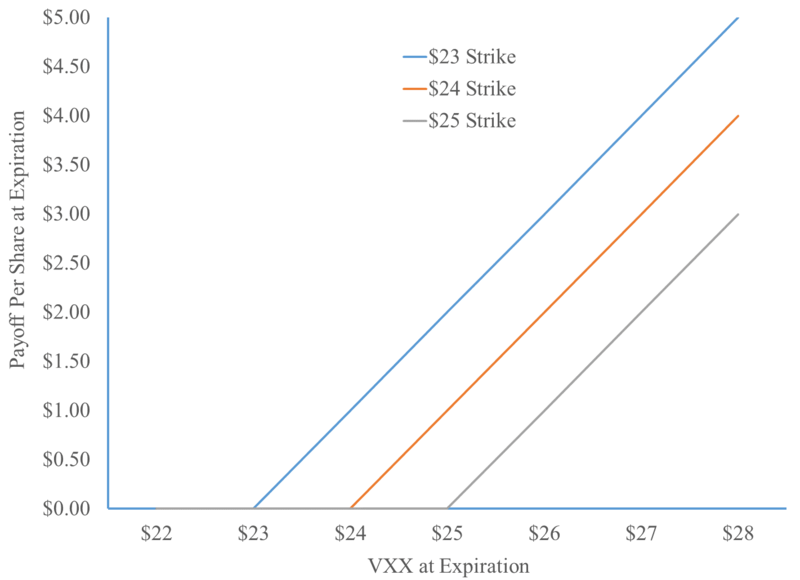 If VXX closes above $24 but less than or equal to $25, the $23 strike price option pays between $1 and $2, the $24 strike price option pays $1 less and the $25 strike option pays nothing. 4. If VXX closes above $25, the $23 strike price option pays more than $2, the $24 strike price option again pays $1 less than the $23 strike price option and the $25 strike option pays $2 less than the $23 strike price option. More generally, if two otherwise identical deep in-the-money call options are about to expire, the difference in the option prices will be approximately equal to the difference in strike prices. The lower strike price option will pay the difference in the two options’ strike prices more than the higher strike price option in the likely event that both options are still in-the-money at the impending expiration. If the options are not deep in-the-money and near expiration, the difference in option prices will be less than the difference in strike prices but the lower strike price call options will still be worth more than the higher strike price call options since the lower strike price call options always pay off at least as much as the higher strike price options and sometimes they pay more. This is the pattern we observe in Figure 2 below. On Friday, August 21, 2015 VXX increased during the day from $18 to $21. Following a nearly identical pattern, the at-the-money call options on VXX increased throughout the day with the lower strike price options trading at higher prices than the higher strike price options. See Figure 2. The differences in option prices illustrated in Figure 2 follow the pattern we expect. Lower strike price options, other things equal, have higher prices. If this pattern doesn’t hold there is an arbitrage opportunity; an investor could buy the low strike price option, sell the high strike price option pocketing the difference in prices and be certain the get an additional non-negative cash flow when the options expire. Such arbitrage opportunities can’t last long in actively traded markets. The differences in option prices are roughly the difference between strike prices multiplied by the likelihood that VXX would increase over the next week and the options would end up in-the-money. The difference in prices approaches the difference in strike prices as we consider pairs of adjacent call options with lower and lower strike prices. See Table 2. On Monday August 24, 2015 VXX traded between $21 and $29 and the option prices we plotted in Figure 2 all increase substantially. We observe some prices on higher strike price options which had been deep out-of-the-money on August 21, 2015 but became at-the-money on August 24, 2015 being distorted by apparent auto-liquidations. Except for during auto-liquidations in the morning, the price of these options with strike prices from $24 to $27 increased up and down through the day Monday closely paralleling the VXX stock price. See Figure 3. Table 3a and 3b report the average option price during the 3-minute periods starting at 9:59am and 10:18am on Monday, August 24, 2015. As illustrated in Figure 3, there were periods in the morning on August 24, 2015 when the VXX call option prices did not decrease with strike prices as they must as a matter of logic, as they had on Friday, August 21, 2015 and as they did again later in the day on August 24, 2015. Figure 4 highlights the VXX call option prices during the morning on August 24, 2015. The prices of these options – especially the $25.5, $26 and $26.5 strike price options - deviated significantly from plausible prices. These anomalies appear to be caused by the price impact of auto-liquidators indiscriminately buying options to cover short positions without regard for the price of nearby options. No options professional would cover a short position to cure a margin deficit in this manner. Consider an active trader who finds herself in a margin deficit and who is short 200 VXX contracts with a $26 strike price expiring in four days. Imagine that the current market price of the $26 strike price option is $5 and the current market price of $25 strike price options is only $4.50. This pattern of prices is an arbitrage opportunity if a market professional (maybe an affiliate of the auto-liquidating brokerage firm?) can act quickly enough, buying the $25 strike price options and selling the $26 strike price options, before the distorting price impact of the auto-liquidations dissipates. Fairly quickly the price of the $26 options will fall and the price of the $25 options will increase enough so that the price of the $25 options is once again greater than the price of the $26 options. Active traders have complained that Interactive Brokers locked them out of their accounts, forcing them to watch as their accounts were liquidated to a debit balance while trades that would have saved the accounts were available. These investors are describing exactly this type of situation. Even though the investor is short 200 VXX call options with the $26 strike price, the $25 strike price options are cheaper and would provide more margin relief per option contract. In our example, it would be much cheaper to cure the margin deficit by buying $25 strike price options rather than the $26 strike price options the trader was short. An active trader still able to trade her account would likely see this and efficiently cure the margin deficit by buying the $25 options. Once the brokerage firms start auto-liquidating an account to meet a margin call, investor-initiated account saving strategies are effectively prohibited.